A gang is robbing jewelers of their diamonds and money on the Calcutta Express train, murdering them in their sleep and then leaping off the train from a bridge. They also steal a diamond from a local jeweler named Hiralal (Sunder) by paying with a cheque written in disappearing ink. Fab! They use a car with license plates matching those of CID Inspector Shyam (Rajesh Khanna). Shyam is in love with Neeta (Nanda), and romances her with the first of many great songs, “Gulabi Aankhen.” Rajesh is forced to imitate Shammi Kapoor’s style, which he does uncomfortably, but Nanda looks gorgeous in her purple churidar and I like their chemistry together. 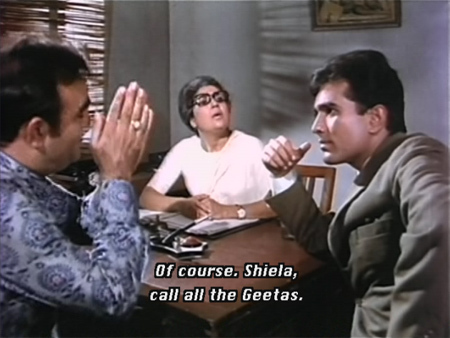 Neeta clearly loves Shyam too, although she balks a little when he proposes that he talk to her mother about their marriage.At the police station, Number One (Madan Puri) calls in to threaten Shyam should he try to catch them (which of course, he will). Police Commissioner Iftekhar (!) is enraged. Shyam listens to the recording of the threatening call and somehow decides that the gang is operating from the Hilltop Hotel. I’ve watched the scene several times and can’t figure out how he reaches that conclusion, but luckily for us the Hilltop Hotel has a cabaret dancer named Lily (Helen). 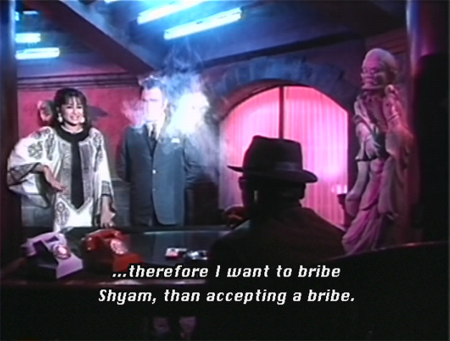 There is much skulking and puffing of cigarette smoke on the parts of Shyam and Number One, while Shetty lurks menacingly and Helen shakes her booty with this guy. Can anyone identify him for me? Is he Oscar or Vijay of the choreography team? Or are these guys? He gets to “sing” in RD’s voice to “O Meri Jaan Maine Kaha.” It’s a cracktastic dance number and Helen is at her very best! It transpires that Lily and Shyam are old friends from college, where Lily had an unrequited crush on Shyam. Number One meanwhile puts in a call to the Boss, letting him know that Shyam is onto them and that he has given Lily the task of distracting him. The Boss urges caution. Shyam is not above using Lily to find out more about his quarry, either! Meanwhile at home, Neeta sings (the lovely “Kis Liye Maine Pyar Kiya”) and waits for Shyam to come and see her mother (Mumtaz Begum). We discover why she has been hesitant about marriage. Neeta’s father Ramdev is in prison for murdering his boss—Neeta and her mother are convinced that he is innocent. The evidence against him is the typically flimsy “he was standing next to the body, covered in blood with the dagger in his hands.” Shyam overhears their discussion as he approaches the house—and then, in an amazing display of bad kismat, Ramdev himself arrives at their door, having escaped from jail. He dramatically threatens to kill himself so that we know how very very much he doesn’t want to go back there, and then Shyam enters the house. Despite Neeta’s tearful pleas and Ramdev’s further threats to kill himself, Shyam arrests him and sends him back to jail—it is his duty, after all. Neeta tells Shyam to get lost and boots him out of the house. Lily meanwhile has been following Shyam around, and she is hauled in to see the Boss by a suspicious Number One. The Boss is pleased with her nefarious scheme though. 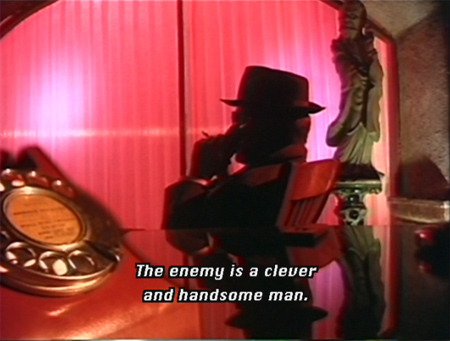 And I like his lair, especially the statue of an ancient Chinese man (and of course the many telephones—symbol of a busy, busy man). Number One goes to visit hapless Neeta and her mother and pretends to be an old friend of Ramdev’s. She asks him to help Neeta get a job—her search thus far has been fruitless since she feels compelled to tell every prospective employer that her dad is a murderer. Number One gives her a job as receptionist at—yes, the Hilltop Hotel. This, by the way, is one of my favorite Hinglish quirks: “explain her” rather than “explain to her.” Very different meanings in English! But I digress. 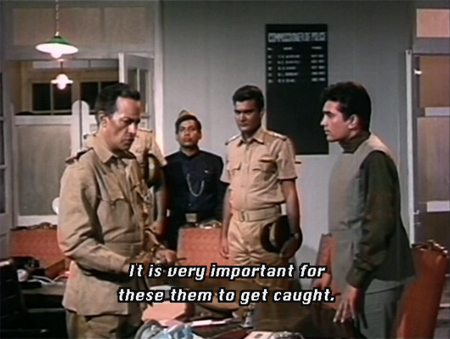 Now we discover how Number One and Shetty have managed to kill the jewelers aboard the Calcutta Express without being caught. Another arrives at the hotel and sells some diamonds to Hiralal, then books his return trip on the Express from the hotel. 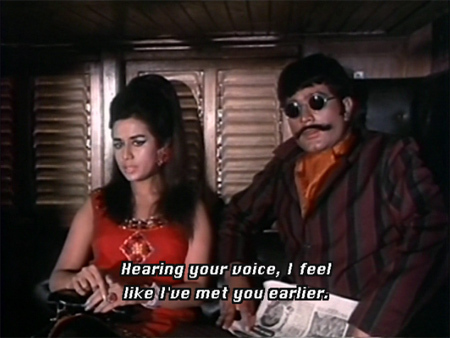 Sharing the jeweler’s train compartment is the gaudily dressed Pyarelal (Rajendranath) and…Neeta! She flirts with Pyarelal and convinces him easily to step down at Igatpuri station for some dinner. 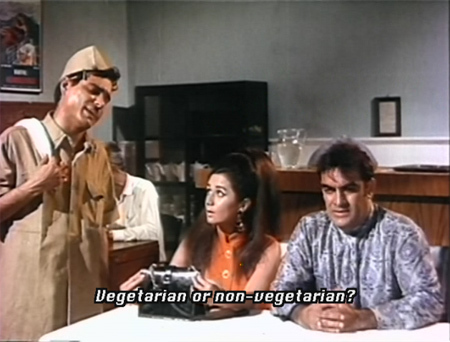 Suhan, with whom I was doing a watchalong, informed me that the waiter in the scene above is Gurnam—Rajesh Khanna’s secretary at the time. I’ve seen him in lots of things and was very happy to put the face with a name at long last! Neeta keeps Pyare distracted until the Calcutta Express pulls out of the station, causing him to miss it and the jeweler to be left alone in the compartment with his briefcase containing 1 lakh rupees. 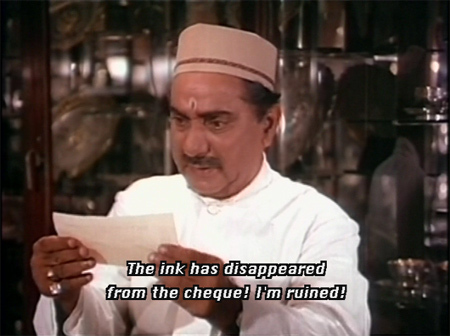 Shetty has hidden himself aboard and kills the jeweler. Then he jumps off the train (with the briefcase) into the river, and is picked up by Number One. Meanwhile, a very unhappy Pyarelal has been left sitting at the Igatpuri station waiting for the next train to reunite him with his luggage at the next stop, Nasik. But at Nasik when the porter goes to retrieve Pyare’s luggage, he finds the murdered jeweler and the police are called in. They track down the unfortunate Pyare at Igatpuri and Shyam questions him. Convinced that he had nothing to do with the crime, he needs Pyare to help him find the girl—named Geeta—whom he is sure was an accomplice. Will Pyarelal recognize Neeta/Geeta as the girl who tricked him? Will Shyam believe her capable of aiding and abetting murder? IS she? Will he be able to stop the gang? Who is the Boss? Can Neeta ever forgive Shyam? Can he save her father from further jail time? And what will happen to Lily? For the answers to all these burning questions, watch The Train. And more than that (because it is a very very silly plot, verging on stupid even), watch it for all the chhote chhote things that make it so much fun. 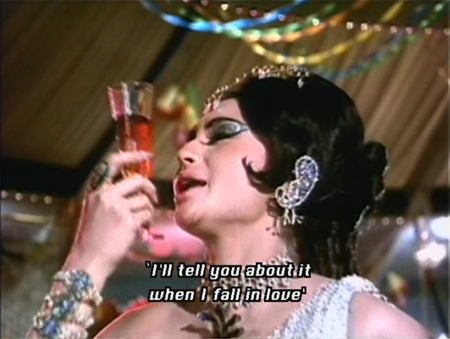 Rajesh and Nanda have great chemistry, although their songs together are extremely awkwardly choreographed. Nanda looks cute as a button in her churidar outfits, chiffon saris, piles of Spare Hair and little go-go dresses (her Geeta avatar is very naughty!). 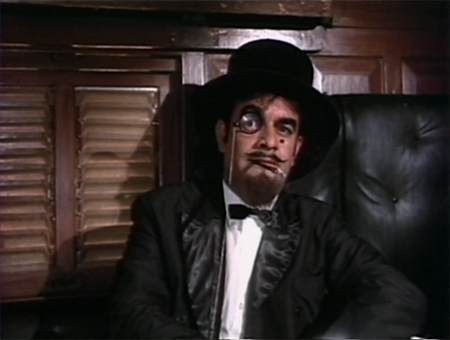 Rajendranath is at his side-splitting best as well. Some fun with Tun Tun! There is plenty more Excellent Use of Helen, including a final song in a peacock gown with fab earrings! Not to forget the most excellent music by RD Burman. The bad story and occasionally iffy acting just don’t matter somehow. It’s one of the great things about Hindi movies—there’s almost always plenty to entertain no matter what! Posted on May 17, 2009 at 1:56 pm in Excellent Use of Helen, Hindi movies	| RSS feed You can skip to the end and leave a reply. Wow that first frame …it is sooooo easy to recognize Rajesh Khanna in any disguise. So great to look at…even with that growing abdominal in one of your screen shots…. We were muchly entertained, thank you! This movie was so much fun! What I love about movies from this period of this genre is that they seem like grown ups enacting an Enid Blyton mystery – everything is as light as a souffle and there’s enough flash and tinsel to keep you entertained. Lovely. I wouldn’t include poor translation for subtitles as “Hinglish”. Actually I have had (Indian) people speaking to me directly in English use the same phrase “I would like to explain you”—it’s very Hinglish. Reminds me of a wonderful Hinglish joke. Clever boy: The cow is under standing the tree. Hmmmm…maybe I need to give this film a second look. When I first saw it, it was near the beginning of experiencing Hindi films and all I recall is that the plot holes were just way too big for me to ignore, and I really did not enjoy the film at all…however, I have seen a lot of Dara Singh films since then…so…maybe I can get past that now. Of course I gave my copy of The Train to the Salem Public Library, so must do some shopping at Nehaflix.com soon. Must agree with you about the music and Helen (especially her marvelous costumes and dancing). The guy she dances with looks a lot like Prince. 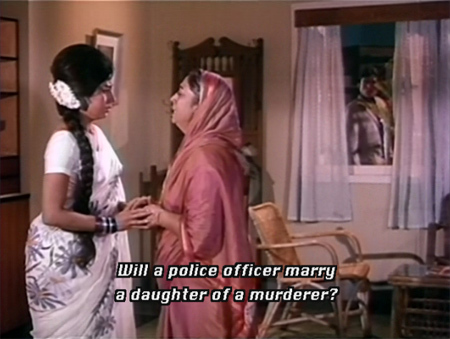 Aruna Irani has a great number in the film as well. It’s their time to shine. Thanks for the great post! I thought of the Prince resemblance too—he really does. I *need* to find out the stories on Helen’s backup guys!!! And the music is utterly FAB. I agree with you. 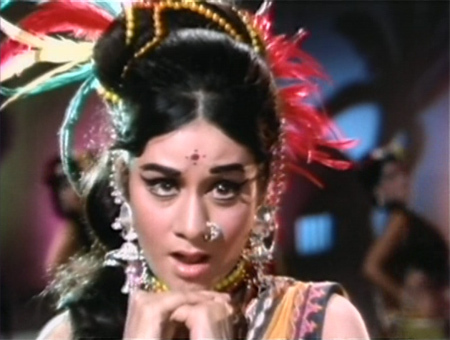 This was in the era when Shammi Kapoor rules…..
…the fun & plot was typical Shammi Kapoor’s. I did not enjoy “The Train”….and I need to search where I kept my old VCD. As long as you aren’t looking for anything realistic it’s very enjoyable :-) And nobody could really imitate Shammi well…he is sui generis! 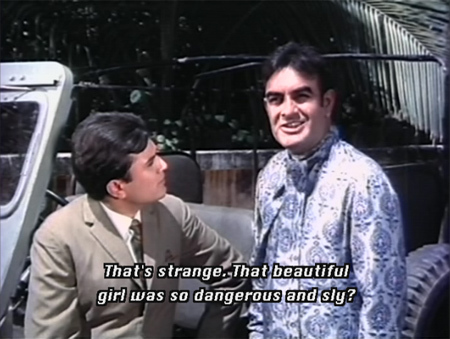 I think this was the first time Rajesh Khanna got to play this James Bondish character. I just love Gulabi Aankhen and can listen to it forever. I saw the movie when I was about 11 and didnt find anything silly in it. Hey even the amazing climax zapped me. 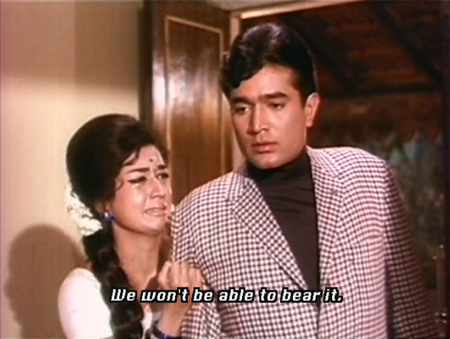 Oh to be 11 again, madly in love with Rajesh Khanna, sigh ! The Train is one of my all time favorites. You can forgive a lot of things when you are a kid! And I guess even as an adult, I can forgive a lot of things when it comes to crazy Hindi films :) The songs are lovely. I have heard the songs countless times but never got to see the movie – not even during the VCR days. I wish i could see it just for the music alone! Just the background music alone is worth it…very cool! I have a Video Sound DVD, which I got probably 5-6 years ago. The first time I watched it though I had no idea who some of these people were (I got it just to see Rajesh basically); didn’t even know really who RD Burman was, let alone that he was singing on the soundtrack! But I liked it even then :) Was very happy to rewatch it. If I wasn’t working, I’d spend the morning watching the film. What a bummer! It’s one of my favourites, too. ‘Hearing your voice, I feel like I’ve met you earlier’. Hmm! That sounds just great for one of my blogroll titles. As usual, very entertaining review, Memsaab! Seemed like Rajendranath or Johnny Walker was in every movie Helen made during the 60’s to early 70’s! Enjoyed RD’s work here,too! Really love the opening chords of “O Meri Jaan Main Ne Kaha.” “Gulabi Ankhen” is another great song1 You just gotta love movies where Helen has such a big role!!.. Such as Mere Jeebvan Saathi and Talaash. And Pagla Kahin Ka… which btw I just ripped the vinyl Lp to mp3. Its an excellent soundtrack plus the album has a cool cover with Helen, Asha Parekh and Shammi playing the sax! Lovely! Someone *needs* to put Pagla Kahin Ka out on a subtitled DVD and SOON!!!!! Come on, universe, help me out here! I added a new category (thanks to this movie) for films that either use Helen in more than one song, and/or where she has an actual role too. This is one of the best of the category! A must for Helen fans. The film was produced by Ramesh Behl, father of Goldie and Shristi Behl, who have kept the ‘Rose Movies’ banner flying. Rajendra Kumar presented the film. 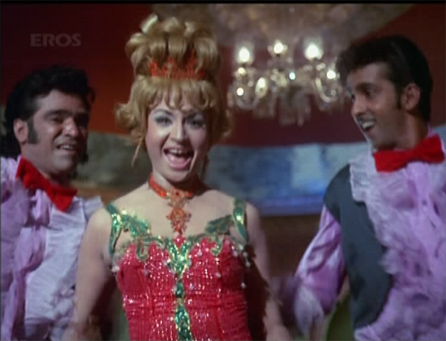 In a scene where the cop and the eyewitness go to a dance school, Aruna Irani appears to do a terrific dance number Chhaiyan re Chhaiyan. 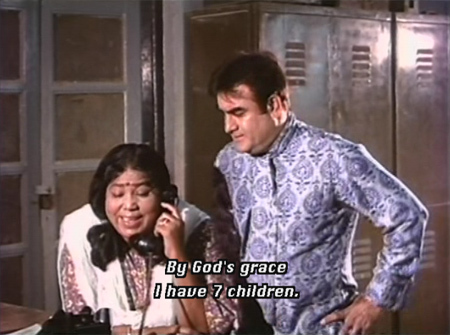 Tun Tun made a one-scene guest appearance, as a woman who won’t give-up the phone when Rajendranath wants to use it badly. An actor called Rajpaul was introduced in the film as the man behind the gang’s operations, but is it not known if he ever did another film. In the year The Train was released, Super Star Rajesh Khanna also had a list of hits that no actor in the bollywood created history so far and the word Superstar coined for him. Wow, you are full of useful information! :-) I was wondering who played the Boss—I will add his name to my internal database of actors. And I didn’t know that Ravi Nagaich was a cameraman and special effects guy in addition to directing. 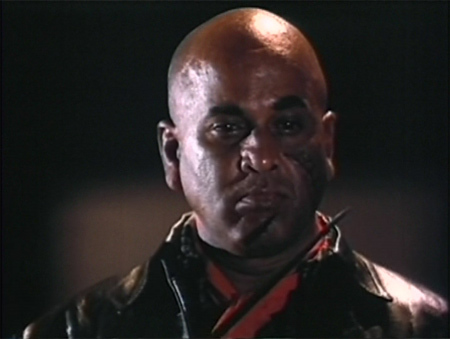 I MUST see Surakksha, just because I *have* to see a film where the main character is called Gunmaster G9 and is played by Mithunda! You cant help but admire Rajesh Khanna in his earleir movies. He was agood actor and spoke impeccable Hindi, unlike Dharmendra who had a bit of a Punjabi accent- though not as much as Dara Singh! In the acting department he was pretty close to Sanjeev Kumar. I think it was his exaggerated mannerisms that put off the audience. 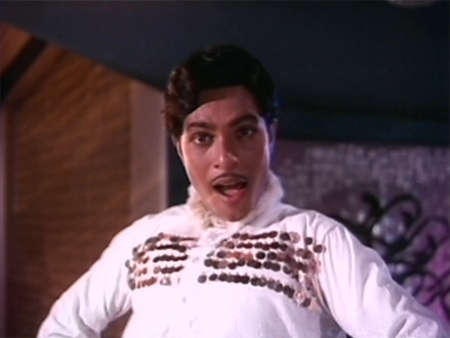 Also the fact that he did not dance well which is where Jeetendra scored over him. And then bad PR and a bad hair style really ruined everything. In any case, he is very handsome and charming in this. I like him opposite Nanda a lot in fact! I remember it as a good entertaining film! I liked Nanda in her bad avatar! She was quite convincing. RD gave fabulous music for this movie. I love all the songs. Awesome sound-track by RD here, one of my favourites, each song is great. This film marked RD’s breakthrough into the top league of composers. Believe it or not, even after scores as diverse as Chhote Nawab, Teesri Manzil, Pyar Ka Mausam, Abhilasha, Waris, Padosan, Baharon Ke Sapne etc. RD still could not take off. But after the success of this score, RD signed a glut of films. Nice review of the film Memsaab, keep it up !. See if you can get Raton Ka Raja (1970), music by RD, it was a flop film, but the music was fantastic. I’ve tried looking for the DVD of this film but have not found it so far, its rare. I just watched this and loved it — despite the English subs on the Shemaroo DVD dropping out on two different occasions, and for about 10-15 minutes each time. I was surprised to find that I knew almost all of the songs already via “Doob Doob O’rama” and other comps. 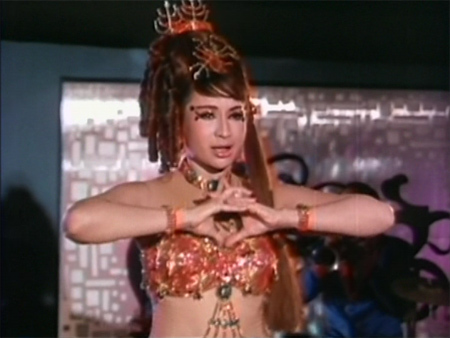 “O Meri Jaan Maine Kaha” is both one of my favorite 70s Bollywood songs and one of my all time fave Helen numbers. You pass igatpuri on the road from Mumbai to Nashik. Every time I travel on that road and see the sign, I always grab helpless co-passengers and tell them the significance of this station. LOL @ helpless co-passengers :) That is funny! Came across a recent interview of Nanda’s in The Deccan Herald (July 19, 2009) where she had this to say about The Train and Rajesh (the page link has disappeared unfortunately). I’ve just watched this–gleefully–on your recommendation. I was so pleased with the excellent color, high quality transfer and subtitling of the songs on my Shemaroo DVD, until the subs dropped out a couple of times, as noted above. Always when explaining how the gang operated, well, I guess the details really are unimportant! You have thoroughtly covered all the high spots. Not only is the music peerless, but I love the psychedelic lighting, pointless jump cuts and zooms in and out, which makes the most pedestrian scene really move along. Especially when Rajesh is bravely hanging onto a stationary train, and the railway tracks, the musical score and the landscape rattles madly all around him. Can’t agree with you about Nanda, though, she has that scrunchy Reneé Zellweger face. I totally love Nanda (not so much Renee Zellweger)! But as long as you enjoyed it, I am happy. Rajesh does hang on bravely to that stationary train, doesn’t he? 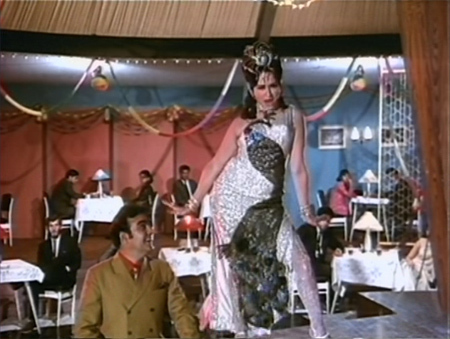 i was reading up your page on helen who for me was the ultimate cabaret dancer in hindi filmdom – just need to compare Don(1978) with Don(2009) – at best kareena has 2 left feet! wonder if you have a list of helen’s top 10 (or more?) cabaret songs – my favorite is monica – oh my darling! great rock score, direction, and helen at her sensuous best waiting for her lover (piya)! Memsaab,we must give tribute to Ravikant Nagaich,the director of “The Train”…very few people will admit that Jeetendra & Mithun Da including Feroz Khan came to limelight due to Ravikant Nagaich(Courtsey-Farz,Suraksha & Kala Sona).He was hired for special effects by Ramananda Sagar for great TV serial”RAMAYAN”.He is specialised in Thriller ,spy thriller. Oh, Ravi Nagaich. I’ve written up quite a few of his movies! He made some movies that I really love and some that I really *wanted* to love but couldn’t…but he certainly had his outrageously entertaining moments in everything he made. Yet another wonderfully entertaining and fast paced Rajesh flick! By now I have conditioned myself so well to ignore gaping plot holes that in this one I did not even notice any! Really amazing soundtrack, I love the number by Aruna Irani as well (didn’t know it was in this movie). RD was just so talented! And Rajesh, looks drop-dead handsome with that magical voice, great chemistry with Nanda as well as with Rajendranath. Just love those two in the second half. Helen looks and moves fantastic! Your review as usual absolutely nails it so do some of the comments! I rewound the scene few times since I could not believe they really made him do that! As I have always maintained, nanda lloked too old for kaka & “the train” is no exception. A throroughly time pass movie with kaka showing that he too can do action roles with aplomb. A superhit when it was released. THE TRAIN was I believe somewhere around 1970,though personaly I Saw the it few years Latter ,as I joined my school this very year in LKG,this one was First ROSE MOVIE production,and to best of my knowledge the producer(RAMESH BHEAL)closely related with RAJINDER KUMAR uncle,a slickly crafted crime thriller by RAVIKANT NAGICH,for whom this was second outing after FARZ(1967) and second hit too,not to forget he was ace photographer too.This was fourth con,tive hit of RAJESH uncle after AARDHANA,DO RAASTE and ITTEFAQ,coincidently the second one with magenetic/magical/bombastic NANDA aunty,their third and last movie was JORU KA GHULAM(sep.1972)which was out n out comic sattire,both these movies had finest music of decade ,not to forget an equal outstanding performances byall and specfic RAJINDERNATH uncle,hereby I will not forget to mention that right through his entire CAREER RAMESH BHAL uncle stuck with one music Director (RD BURMAN DA)and one song writter (GULSHAN BAWARA)uncle a unique/distitive/close netted bond which only few people can have till his passing away in early nintees,another unique about this movie was that music rights of movie were with (POLYDOR)which have just begun their foothold in INDIAN film Industry,but the cover version of same were launched by HMV.Fourty three after its release it still holds the same charm and today you can hear its music,A must see movie for generation born post 1980.RAVINDER MINHAS,JALANDHAR CITY,PANJAB.minhas35@yahoo.com. Hi memsaab, hope you’re well. I’ve no idea if you’ll read this as it appears that the last rsvps were several years ago. But here goes anyway. 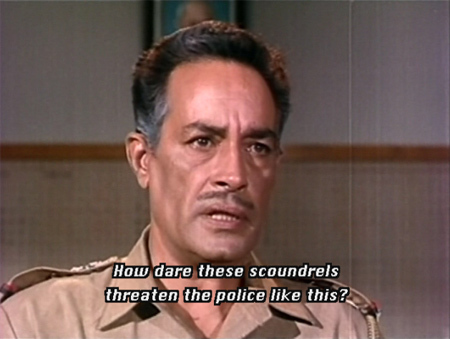 In response to your query about how inspector Shyam figures out that the enemies are at the hilttop hotel, it’s all about the honking horn he hears on the playback of the recorded.conversation. So even more incredulously, he’s been driving around bombay (as it was in 1970), trying to listen out for the particular horn being honked by ANY car. And thus said car would be the link to the gang. Hope yu have a great week. i have one problem with this movie. inspector shyam saying time to time zaleel aurat. i found it very insulting. i laugh heartily when i watch gulaabi aakhey jo teri dekhi shraabi yeh dil ho guya. running and all dancing with help of trees. 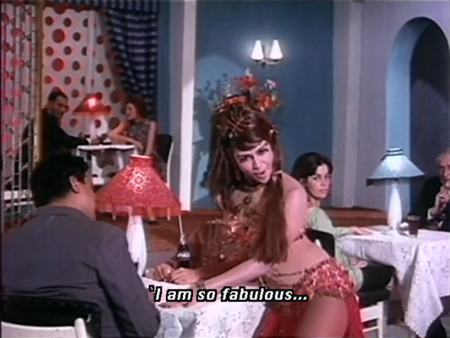 shammi could have danced so easily. and nanda recommended rajesh name as hero. my mother appreciates her that she helped so many new heroes in building their career.